Are you having trouble fighting the summer shed? If you have a dog that sheds then you know they shed all year long but the summer is the time when it hits the fan...literally! It's so important to keep your dog's coat in good shape during the summer months when it really warms up to keep them cool and comfortable. Today, we are going to share three ways we have been fighting the summer shed with the Goldens. Disclaimer: Golden Daily Scoop received the Isle of Dogs De-Shed Products in exchange for our honest review. We received no other compensation and Isle of Dogs is not responsible for the content of this post. 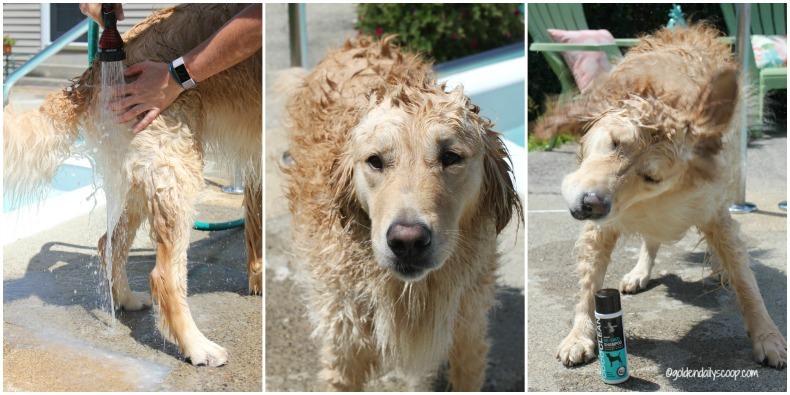 Summer is an important time to keep your dog's coat clean and healthy and the one way to do that is by bathing. With the Goldens swimming in our pool during the summer I like to give them a quick bath outside once a week. 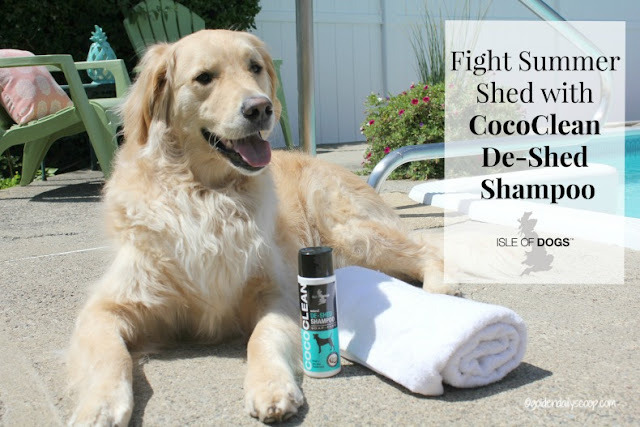 Isle of Dogs™ has a great shampoo to help fight the shed. 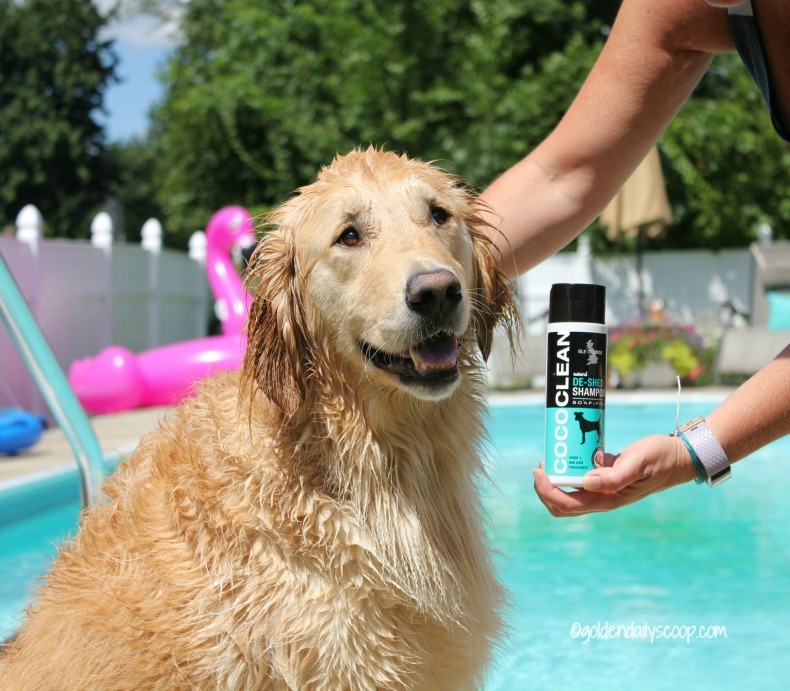 CocoClean De-Shed Shampoo is a custom formulation that helps reduce excessive shedding and is blended with coconut oil to help improve their skin and coat. Best of all it's soap-free, sulfate free and paraben free. 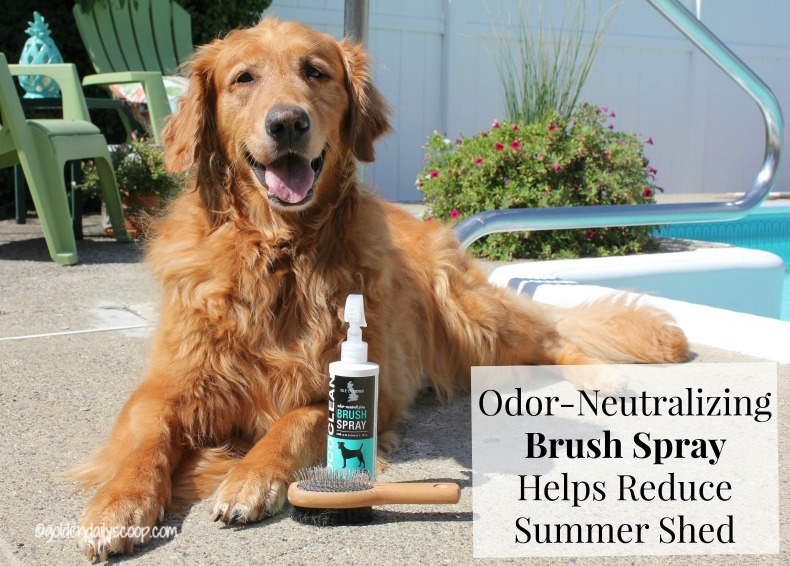 It also features, ExtenScent, a natural odor-neutralizing complex that extends freshness and keeps dogs smelling better, longer. 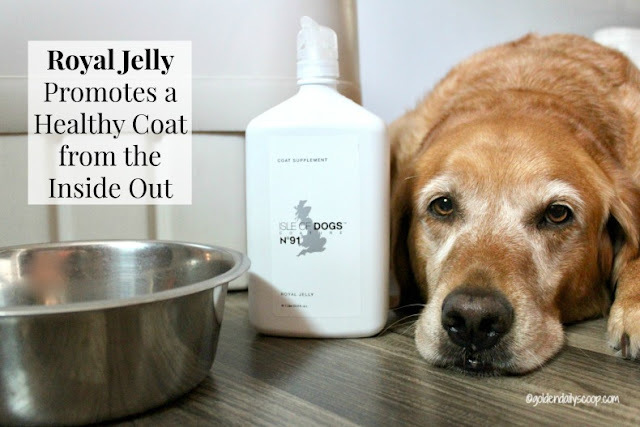 Coconut oil has so many benefits when it comes to our dog's coat. It helps relieves dry, itchy, flaky, & irritated skin. It reduces protein loss and strengthens hair. It promotes a stronger protective skin barrier. It's also all-natural refreshing deodorizer. Bath time is just another way to bond with your dog and as you can see Bruin really enjoys it. The CocoClean De-Shed shampoo is soap-free and the fragrance is violet + sea mist. I wish you could smell this shampoo because it smells A-Mazing-ing! A little bit of this shampoo goes a long way, it's super easy to lather into the coat and rinse out. Time for a little rinsing and a whole lot of shaking! After a towel dry and some much deserved nap time in the sun, Bruin looked like he could be on the cover of a magazine! Check out his before and after photos! You can see just from his chest all the dead fur that came out. He feels soft and silky and smells great! The second way we fight the shed is brushing them daily. I can't say this enough, brush brush brush, especially in the summertime! The more you brush them and the more dead hair that you can get off them, the more comfortable they will be. Not to mention the cleaner your floors and furniture will be! I love to use a brush spray in between baths, the one we have been using is Isle of Dogs Odor-Neutralizing Brush Spray Violet + Sea Mist. 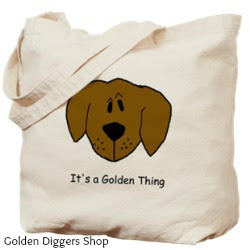 The Goldens spend a lot of time outside during the summer which can lead to lots of grass rolls, snooping in the gardens and many of games of fetch. All this leaves the dogs smelling not-so-fresh and looking like a hot mess. If there is one thing that Miley loves, it's her brush sessions. As soon as she spots the brush in my hand she gets so excited. Like bath time, brushing your dog is a great way to bond with them and having three Goldens, Miley and I enjoy our alone time together. Did you know that you shouldn't brush your dog's coat when it's dry? Applying a brush spray prior to brushing prevents hair damage. 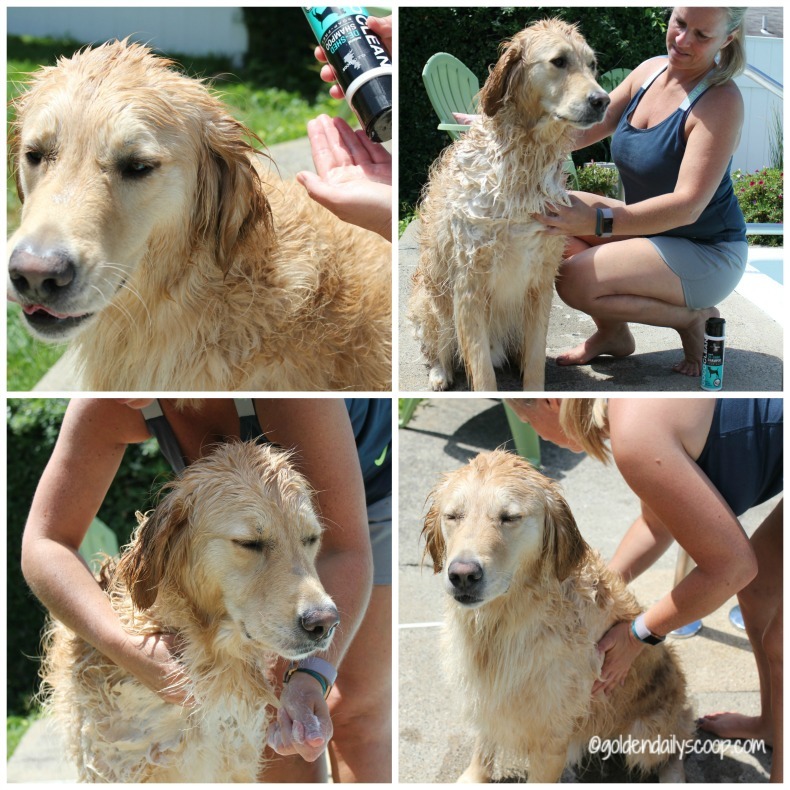 Brush sprays are great for reducing shedding, static and helps maintain a healthy coat that will stay cleaner in between baths. Once you've sprayed your dog's coat all over (avoiding their eyes) let the brushing begin! For daily brushing, I use a Rounded Pin/Bristle brush thats gentle enough to use every day, then once a week I will use a FURminator to really get the undercoat. 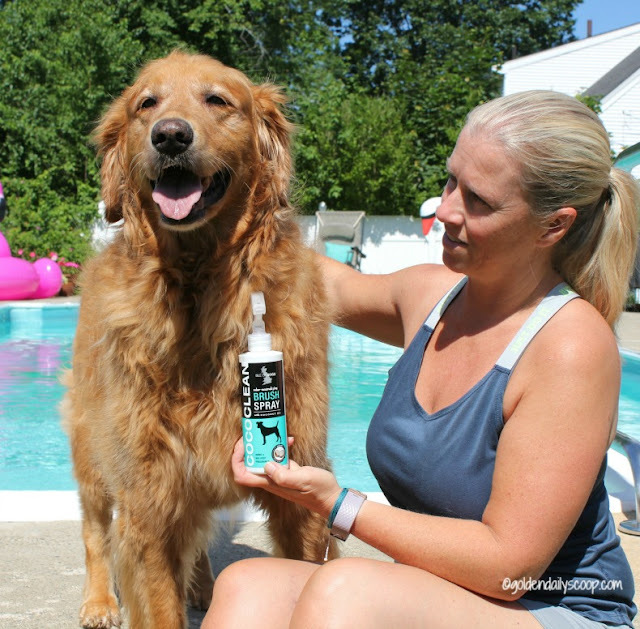 Just like the De-Shed Shampoo, the Brush Spray is blended with coconut oil and also features the ExtenScent which leaves your dog's skin and coat soft and silky and smelling better, longer. Check out all that FUR I brushed off Miley! She is one happy dog and I am one happy dog mom that all that fur will not end up in my house! It's not only what we put on our dogs that keeps them healthy but what we put in them nutritionally that gives them a healthy coat. Adding supplements into our dog's daily routine can really help them shine from the inside out. Isle of Dogs Royal Jelly Coat Supplement is healthy supplement that you pour into your dog's food daily that is packed with wellness benefits. Royal jelly is a milky secretion produced by worker honey bees. It gets its name from the fact that bees use it for nurturing and sustain the queen bees. These queen bees grow larger and live significantly longer than the average bee. Royal Jelly contains remarkable amounts of proteins, lipids, and vitamins that promote the regeneration process. It is recommended for breeds that shed or have wispy, lifeless hair. 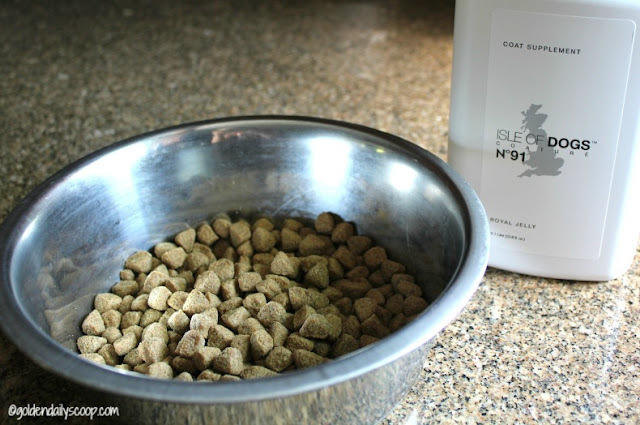 It promotes a healthy coat by reducing shed and strengthening the coat. Heals inflamed and irritated skin as an anti-inflammatory. Promotes new hair growth. The proteins and vitamins in royal jelly can boost fur regeneration. 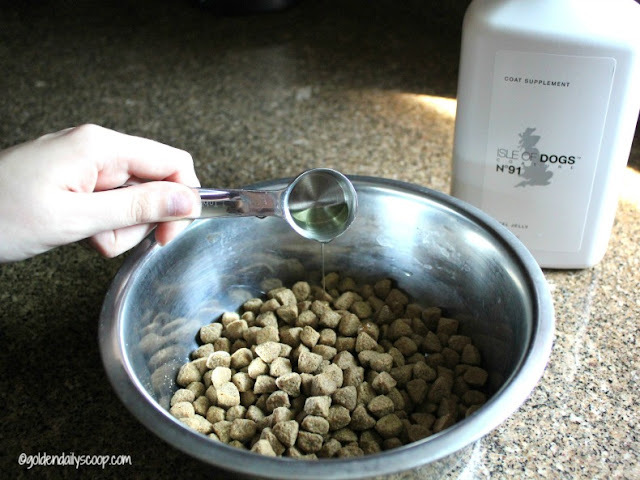 We have been adding the Royal Jelly Coat Supplement to the Goldens food starting out with just a teaspoon poured onto their food and worked our way up to a tablespoon daily. Always start with a smaller amount than recommended to make sure there is no allergic reaction as bee products may cause allergic reaction in some dogs. Safe use in pregnant animals or animals intended for breeding has not been proven. Consult your Vet before starting your dog on any supplement. 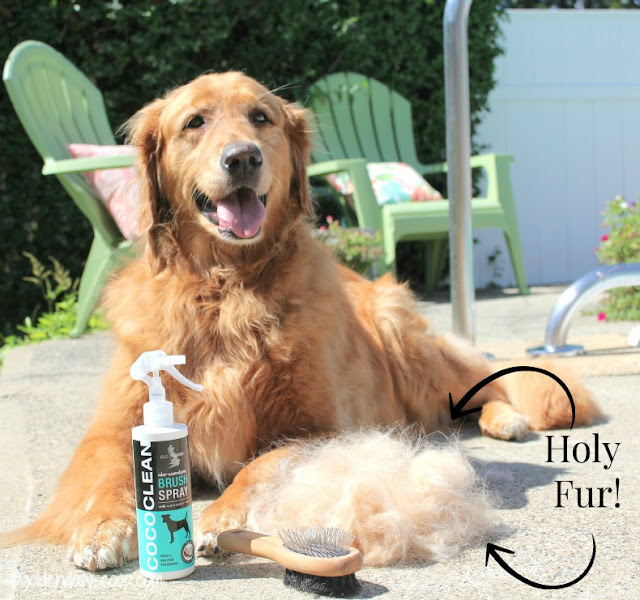 Although we can't stop the shedding entirely, I have found these three ways do help reduce the amount the Goldens shed effectively, leaving them with a healthy coat and me with a clean house! 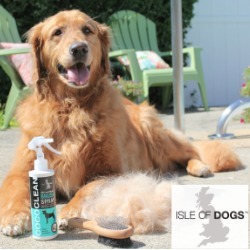 Isle of Dogs™ combines natural grooming products with nutritionally superior food, treats and supplements to promote wellness and beauty from within. If you are constantly fighting the summer shed, we recommend bathing, brushing and a coat supplement with any of the Isle of Dogs products. 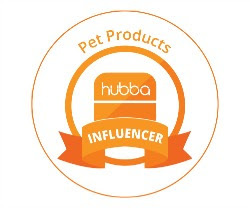 They have a great line of Inner Wellness and Outer Beauty products that will help with the shed and show off our dog's unique shine! 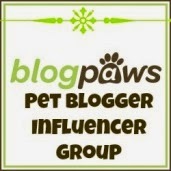 Does your dog shed? 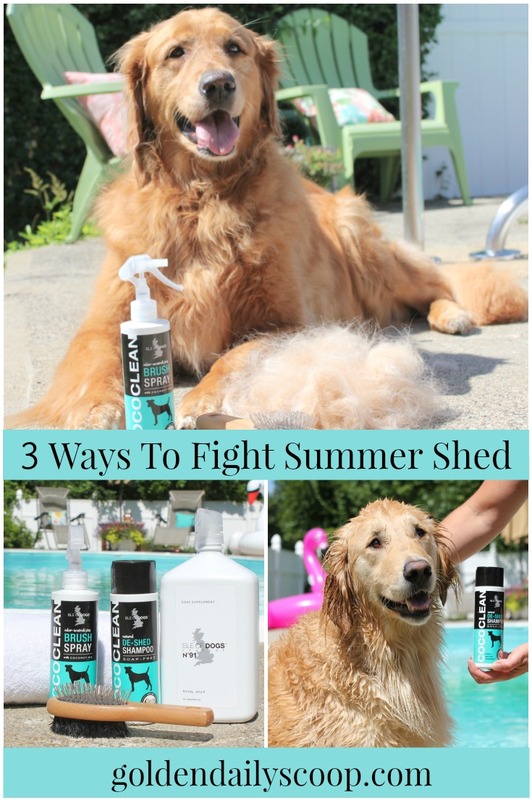 How do you fight the summer shed? 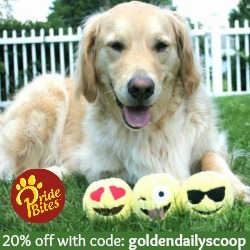 The Goldens LOVE the Royal Jelly, it's like they are getting a treat with their food! I've heard so much about using coconut oil for pets' coats. The coat supplement sounds interesting. I have to see if there is anything for cats. I'll be honest - we don't brush and bathe our dogs as often as we should! I was brushing Tut that other day and I swear I had enough hair to produce a clone. He and Sophie have both been shedding like crazy! I've never used a deshedding shampoo, but I probably should. I can't believe how much hair my Husky Icy has lost - and there's still so much more! Like it never ends. Those Before and After photos look gorgeous! What great results. 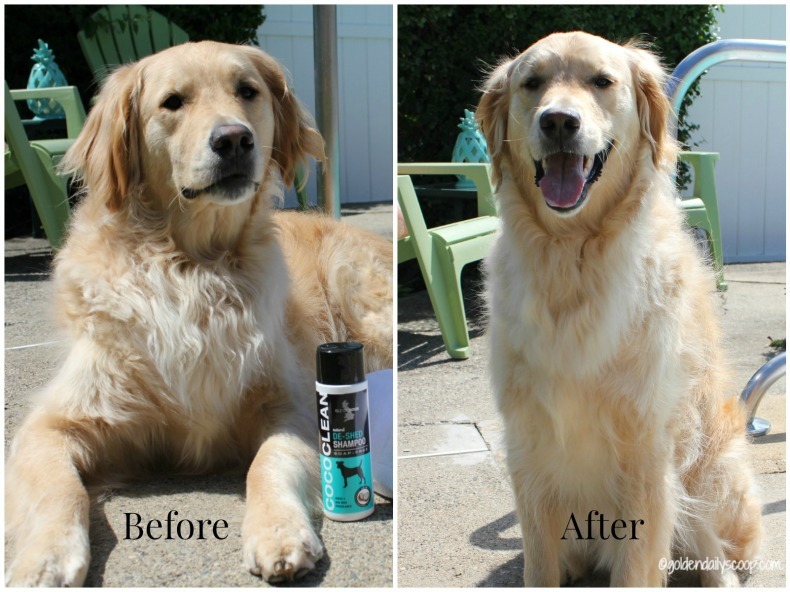 We've always had great results with FURminator. Not that we worry that much about shedding; it's just to remove the loose fur for the dogs' comfort. It is true that it comes off much easier after a bath. Yes, the FURminator does wonders for the undercoat! Thanks for stopping by! 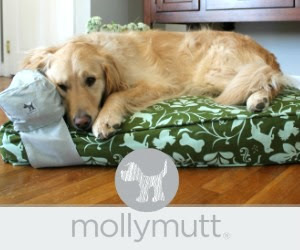 I am not familiar with this brand, but your dogs are great ambassadors for it. They all look soft and silky! That brush spray sounds amazing!! Helo sheds SO MUCH year round, especially in the summer. Thanks for sharing. Love your pics too! That is a lot of dog fur!!!! A bath in the summer also keeps them cool - at least until they dry off. My cockers shed, but I shave them about every 6 weeks and brush them daily. This seems to limit the fur. They don't like brushing, so maybe I should try the spray, especially in the winter when their fur is long. I would try the brush spray in the winter not only does it help with their shedding but it leaves them smelling great! I haven't used any Isle of Dog products but I hear good things. I want to try it out once we finish our giant shampoo stash. So much fur came off Miley! Ah, yes, shedding! With Siberian Huskies, we wear fur as an accessory here! It's a daily brushing routine here, and an occasional blow-out for all their undercoat. LOL! I like the idea of the brush spray, I will have to check that out! Thanks for the great review. I'm Pinning this, too! Hmmmm, not sure about cats. I know exactly what you mean, LOL! It's funny, every morning for the past week or so I always know where our cat was sleeping because there are always clumps on fur!